Eduard Strauss's son, Johann III was also a conductor and composer, but soon earned the disapproval of his father because of his extravagant lifestyle and taking advantage of the fame of his forebears, including re-using some of their melodies. His music is generally not rated as highly as that of his predecessors, although a few of his compositions are not at all bad. 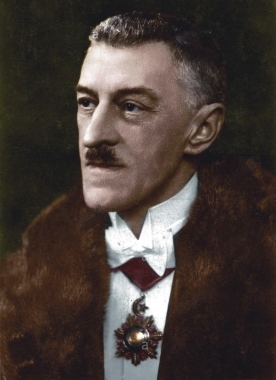 He wrote one operetta, Katze und Maus, in 1898 from which a number of compositions were derived, and his other notable pieces included the waltzes Krönungswalzer, Unter den Linden, and Die Schlittschuhläuferin, and the quick polka Im Galopp. He moved to Berlin soon after his father’s death, and, apart from a few conducting appointments went largely unnoticed. In his earlier years he composed some 40 works but then seems to have given up, as no trace of later compositions has been found. He died in Berlin soon before the outbreak of World War 2.